Cabins Unlimited are proud to be one of the only timber building suppliers in the UK to be able to supply specialist roof and floor insulation kits for pretty much any timber building! From a simple shed, garage, log cabin or more complicated Timber Frame Building we have a Tested Solution to insulating your building's Floor and Roof. 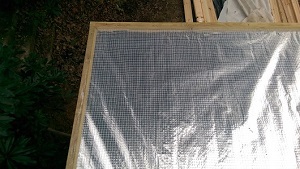 Images of this insulation being installed at a recent customer log cabin builds have been added below. Without our Log Cabin Insulation Kits, condensation in your log cabin roof will cause decay, mould and discolouration over time. Our Insulation kits have been scientifically proven to have no risk of condensation. This scientific data is in our archives and has been carried out by an Energy Systems Company for us. Our Insulation Kits are delivered FREE alongside the purchase of your building, for convenience and an all in one package from our company. What is included in our Insulation Kits? 1. 25mm Thick Celotex Insulation Boards. Cabins Unlimited use a Market-leading product for insulating all of our timber buildings, this product is Celotex, a compressed foam material between silver foil. Celotex is foil backed on both sides, rigid and measures out at 1200mm x 2400mm in size. The thickness of 25mm provides more than enough high performance insulation qualities to keep the heat in or out of your cabin. Celotex is ideal for Apex, Hipped and Pent roof buildings and continuously maintains its energy-saving characteristics once fitted. Enough Celotex is supplied to provide an Insulation layer both on top of the roof and under the floor, perfect for a log cabin insulation kit. 2. Specialist 1mm Thick Vapour Control Membrane. Our membrane is a thermo-reflective reinforced Vapour Barrier with aluminium foil/barrier layers to maximise energy efficiency. This foil helps with reflecting heat back into the building, meaning a great addition to an already sufficient kit. The building is properly sealed using this layer to control ventilation and prevent heat loss which is in compliance with certain Building Regulations we are more than happy to specify if required. When fitted correctly, our membrane main feature is that it protects the building from condensation which is vital when storing electronics, tools or other property that is important. As impermeable air-barriers, VCLs also increase the building’s air-tightness. In addition to all other benefits, this VCL is also water tight when fitted correctly, providing another layer of protection should the roofing covering you use fail. • Suitable for roof, wall and floor installations. • Control ventilation, acting as an air barrier. • Controls vapour to minimise condensation. 3. 11mm Thick OSB (Oriented Strand Boards). 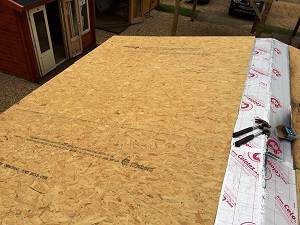 At Cabins Unlimited, we use OSB as a holding layer for the Celotex Insulation Boards that we supply, these are screwed and fitted through the Insulation and treated battens around the perimeter of the roof. 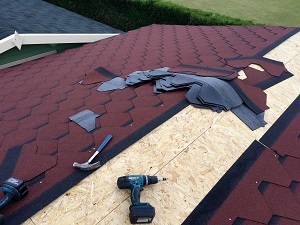 As well as a holding layer, this provides means of being able to fit your choice of roofing material, whether this be just standard felt, shingle tiles or EPDM. OSB is used by many as flooring for cabins, sheds and hundreds of other uses however we decided that complete timber the same as that used in the cabin was best to be used as flooring. As you will see all of our buildings unless otherwise stated, come with tongue and groove roof and flooring as it is far more attractive and appealing to our customers. These battens, also supplied in the kit, are used to create a perimeter around the edge of the roof that takes away any visibility of and retains the Insulation boarding (Celotex). More than a sufficient amount of battens are supplied to create this perimeter. These battens measure out at 2.4m in length and are supplied fully sawn and treated. 5. Thermo Reflective Aluminium Tape. This insulation tape connects any joins between the Celotex Insulation boards and joins the overlap from the Vapour Control Membrane in the roof of the kit. This prevents any heat escaping any joins in the kit. This tape can also be used to cover up and scratches, scuffs or breaks in the Celotex Boards should these occur during installation. All necessary fixings required to fit the entirety of the kit are supplied within the package alongside the kit. The main benefit of purchasing an insulation kit from us is that everything is delivered in one, including all necessary screws to fit the insulation kit. Please click here to view and download our step by step guide on how to fit our insulation kits. We do not offer wall insulation for any of our buildings as the thickness of the walls for most of our buildings is completely adequate for use. Heat tends to escape through the roof and floor, with timber already being a good insulator there is no need to insulate the walls of any building with 40mm or thicker walls.